Phuket is not only about beaches, beautiful sceneries and wild outdoor adventures. It is also a gastronomical haven for food enthusiasts. That’s why I especially my husband Frederick are captivated by this place (We shall return – that’s my husband’s promise). Thai food is internationally famous. 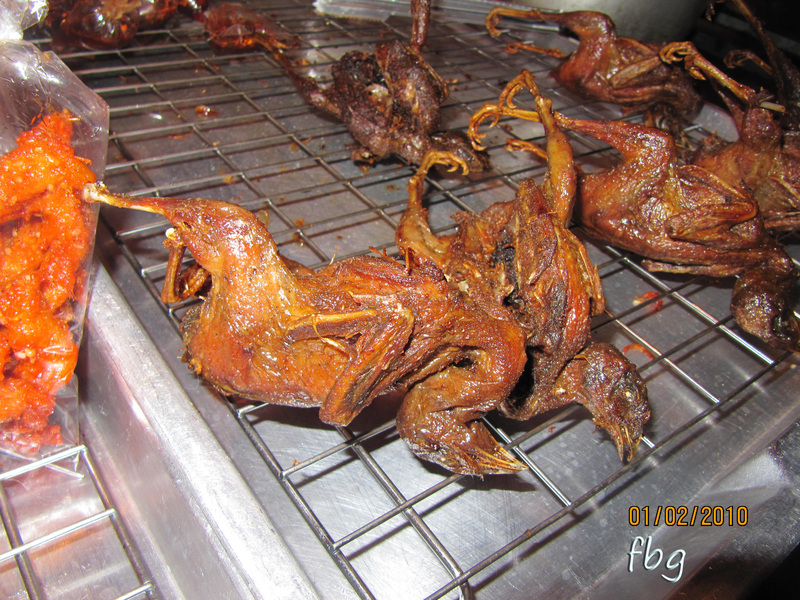 There are lots of Thai restaurants and food manufacturers worldwide who are cashing out on the commercialization of Thai food. Personally, I love Thai food. It's because of the unique blend of flavors and aroma in every dish. We observed that Thai cooking like most Asian culture used a lot of spices and herbs, producing an almost perfect balance of taste : hot, sour, sweet and salty. Thai dishes also are visually appealing, the aroma makes me salivate, the taste makes me crave for more, and definitely it always gives my tummy full satisfaction. There’s a wide gamut of Thai restaurants and eateries at Patong beach from mobile food carts selling streetfoods like pancakes, corns, fried and grilled fish, squids, dried seafoods, chicken, and pork; to hawker food courts that offer variety of Thai, Chinese, Indian, muslim dishes; to restaurants that serve seafood buffets, beers, with a band singing in the background; up to world-class fine dining restaurants that serve nouvelle cuisines and fine wines. Well we settled only with the first 3 coz we were on a budget. There are also French, Italian, western, and other foreign restaurants aroung Patong that caters to those tourist who are missing their own home-food. Oh, by the way, Thai food is influenced by different cultures – Western, Chinese, Malay, Muslim, Indian, and other cultures from its neighboring countries. Actually Filipino food and Thai food have lots in common. 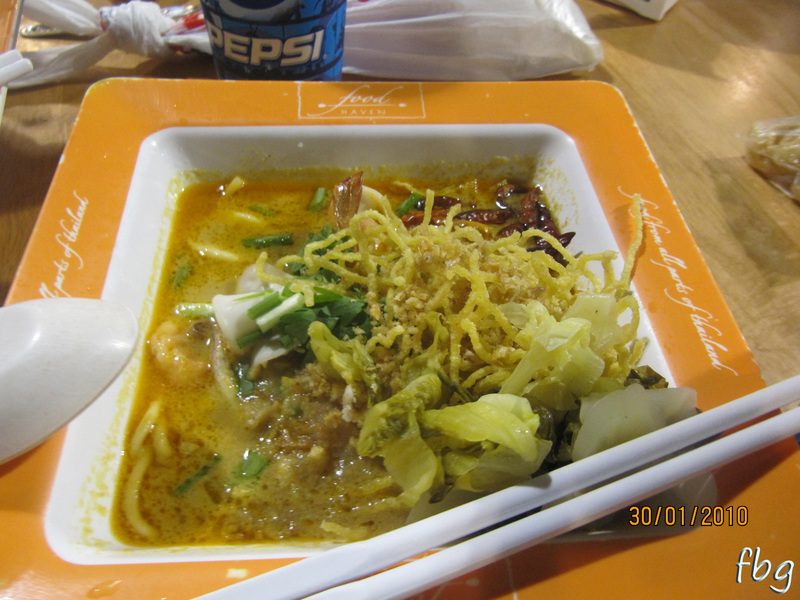 We had our first taste of Thai food at Jungceylon mall with a serving of flavorful Northern style pork curried noodles with coconut milk for only 60 Baht a bowl, Frederick zest up his with a squeeze of lemon, plus fried pig skin they call cab moo (20 Baht) as sidings (Chicharon in Filipino) – t’was really satisfying. 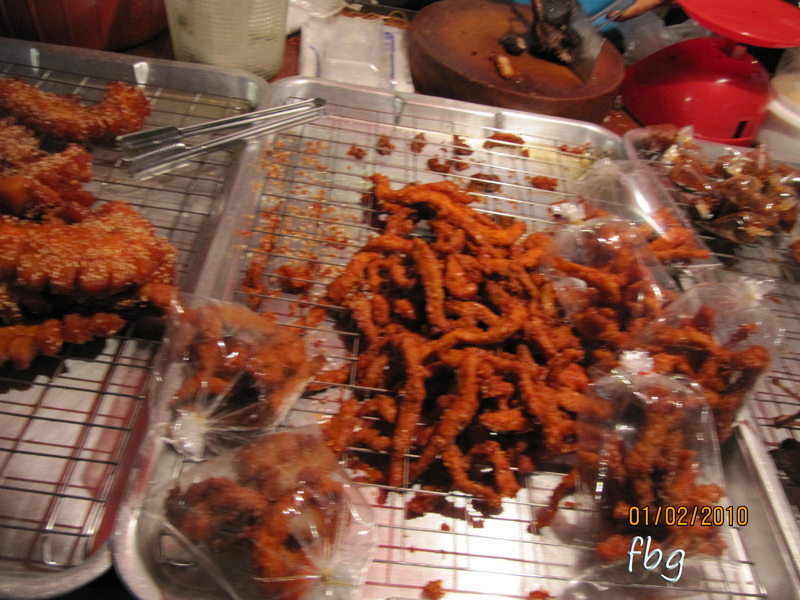 We also snacked on deep fried crispy, sweet and spicy chicken skin that we grabbed at 15 Baht from a food cart on our way to the beach. 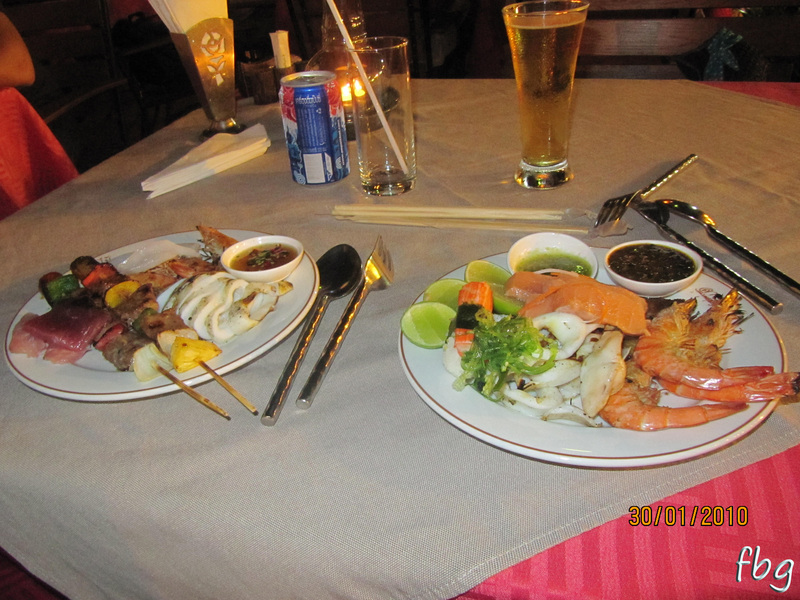 On our first night we had a candle light dinner in a classy open-air yet affordable restaurant that offer sea-food buffet along Bangla Road. 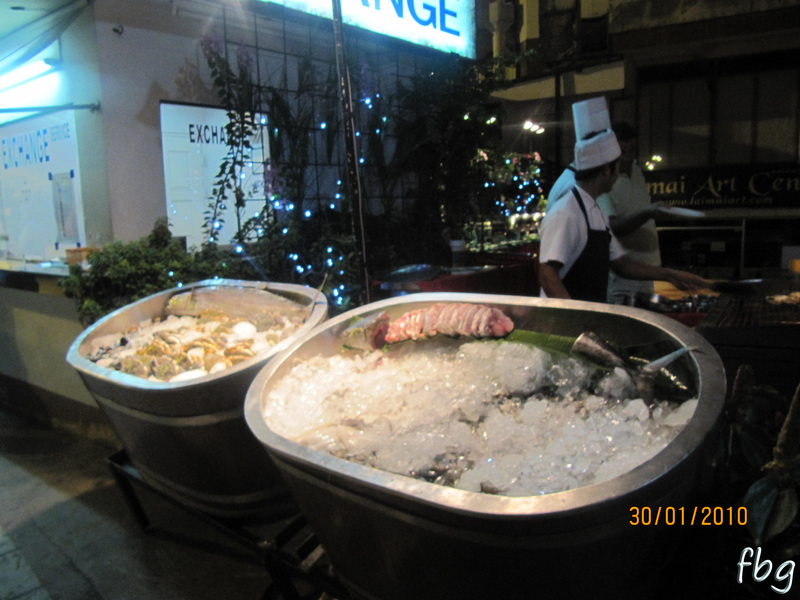 There are la diverese choices of fresh seafoods - from salmon sashimi, other fishes, shrimp, crabs, squids. There are also red meat - pork, beef, and chicken, and noodles, and veggies. We get to choose the seafood or meat we want and have it grilled or cooked to our liking by the cook. They serve pineapple, banana, watermelon, chocolate fondue for dessert. It costed us around 800 baht per person and that included the drinks. The cooks and gals & guys waiting tables are all local except for the band playing on stage who are Filipinos and they play Filipino songs :-) Isn’t that awesome? On the days that followed, we enjoyed different Thai dishes. 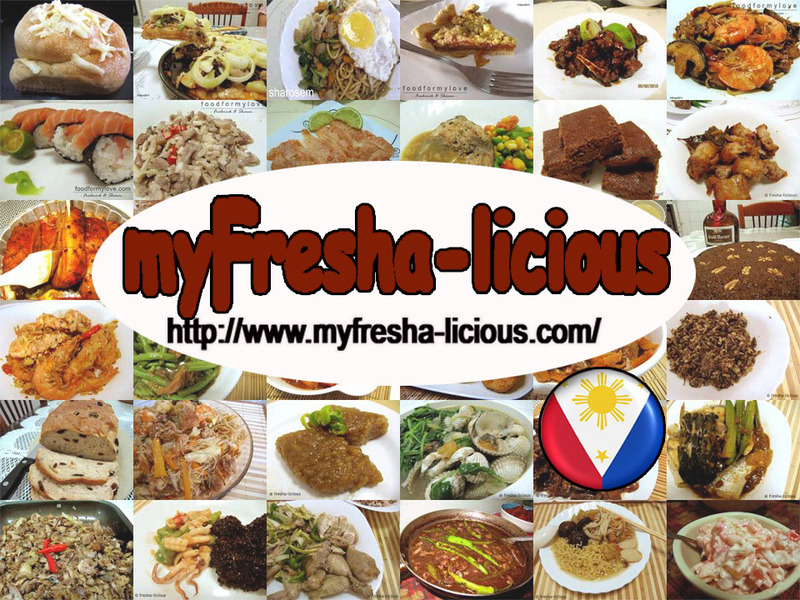 There’s tomyam (which is almost similar to our sinigang with an addition of lime leaves), Thai version of tempura, sweet and sour fish and pork and different kinds of curried dishes from yellow to orange to green curries. And a lot more of fresh fish and other seafoods match with freshly squeezed fruit juices that Frederick loves to drink. And yes, we ended our second day with Smirnoff and Bacardi – with my husband passing out wehehehehe. 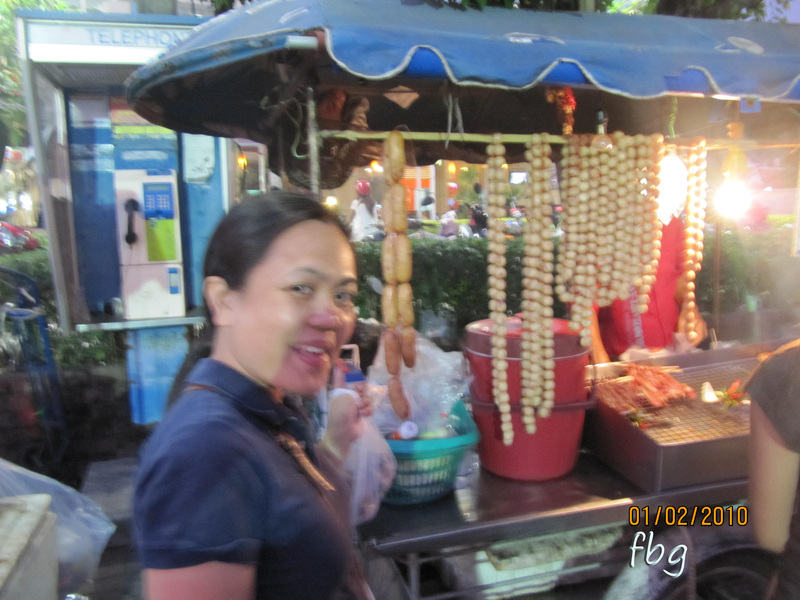 We love the food in Thailand and we will definitely go back to savor it once more.